Nicole Evangeline Lilly (born August 3, 1979) is a Canadian actress. She gained fame for her role as the character Kate Austen in the ABC program Lost (2004–10); for this, she won a Screen Actors Guild Award and received a Golden Globe Award nomination. She is also known for her roles as Connie James in The Hurt Locker (2008), Bailey Tallet in Real Steel (2011), Tauriel in The Hobbit film series (2012–14), and in the Marvel Cinematic Universe, she starred as the superhero Hope van Dyne / Wasp in the films Ant-Man (2015) and Ant-Man and the Wasp (2018). She will reprise her role in the upcoming Avengers: Endgame (2019). ^ a b MacDonald, Gayle (September 11, 2005). "The blooming of Evangeline Lilly". The Globe and Mail. Retrieved April 23, 2012. ^ "Monitor". Entertainment Weekly (1271): 22. August 9, 2013. ^ "Evangeline Lilly Profile". The New York Times. Archived from the original on October 29, 2013. Retrieved February 7, 2017. ^ "Evangeline Lilly". Religion Facts. Archived from the original on October 26, 2006. Retrieved October 3, 2006. ^ "TV Guide Profile". TV Guide. Archived from the original on August 1, 2013. Retrieved July 15, 2013. ^ a b Heyman, Marshall (June 2009). "Evangeline Lilly Uncensored". Women's Health. Archived from the original on September 1, 2013. Retrieved July 15, 2013. ^ a b "Evangeline Lilly: 'I was a grease monkey'". Metro. July 1, 2008. Archived from the original on October 14, 2013. Retrieved July 9, 2013. ^ "'Lost' star talks up movie at TIFF, recalls ill-fated stint as flight attendant". CP24. The Canadian Press. September 10, 2008. Archived from the original on September 28, 2015. Retrieved September 26, 2015. ^ "A Spiritual Biography of Evangeline Lilly". ReligionFacts.com. Archived from the original on October 26, 2006. Retrieved October 3, 2006. ^ a b "About Evangeline Lilly". Yahoo. Archived from the original on May 17, 2013. ^ "Stars Discovered by Chance". Comcast. Archived from the original on May 20, 2015. ^ a b c d "Evangeline Lilly". The Canadian Encyclopedia. Archived from the original on May 15, 2013. Retrieved April 23, 2012. ^ Bianco, Robert (October 12, 2004). "'Lost' finds ungilded Lilly". USA Today. ^ Foley, Jack. "Lost: Season 2 interview - Evangeline Lilly (Kate)". Indie London. Archived from the original on March 11, 2014. Retrieved March 11, 2014. ^ Keveney, Bill (January 4, 2005). "The many aliases of J.J. Abrams". USA Today. Archived from the original on November 4, 2012. Retrieved July 4, 2013. ^ Woerner, Meredith (May 18, 2010). "Lost: The 14 Casting Tapes That Started It All". io9.com. Archived from the original on March 10, 2013. Retrieved July 4, 2013. ^ Carter, Bill (January 30, 2008). "Tropical Teaser: 'Lost' Clues Decoded". The New York Times. Archived from the original on December 9, 2013. Retrieved February 7, 2017. ^ Schillaci, Sophie (January 25, 2012). "Johnny Depp, 'The Dark Knight,' 'Lost' Named to IMDb's Top 10 of the Last Decade". The Hollywood Reporter. Archived from the original on April 22, 2014. Retrieved September 26, 2015. ^ Snierson, Dan (December 8, 2004). "Evangeline Lilly". Entertainment Weekly. Archived from the original on September 7, 2014. Retrieved July 6, 2013. ^ Bianco, Robert (June 12, 2008). "Who Will Make Emmy Happy?". USA Today. ^ "Survey Says Evangeline Lilly Is The Hottest Woman On TV". StarPulse.com. March 21, 2007. Archived from the original on July 6, 2013. ^ a b "'Lost' Star Evangeline Lilly May Quit Acting; Plans Charity Work In Rwanda". StarPulse.com. February 2, 2010. Archived from the original on February 5, 2010. ^ Ryan, Mike (May 4, 2010). "Evangeline Lilly on the End of Lost and the One Scene She Would Rewrite". Vulture. Archived from the original on August 5, 2014. Retrieved July 9, 2013. ^ Pasquella, Cynthia. "For Evangeline Lilly, Lost is a Means to Charitable Work- Not Stardom". cynthiapasquella.com. Archived from the original on August 13, 2014. ^ "Jeremy Renner and Evangeline Lilly in The Hurt Locker". FanPop.com. ^ "John Malkovich, Evangeline Lilly and Romain Duris shooting Afterwards in Canada this summer - A Canada / France Co-production". Newswire.ca. April 13, 2007. Archived from the original on September 27, 2015. ^ "'Lost's' Evangeline Lilly writing books". The Arizona Republic. June 4, 2010. Retrieved September 26, 2015. 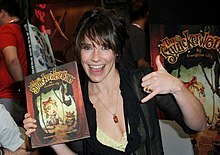 ^ "Evangeline Lilly Wants To Write Kids' Books: 'The Squickerwonkers' Is In The Works (VIDEO)". Huffington Post. June 3, 2010. Archived from the original on September 28, 2015. Retrieved September 26, 2015. ^ Reiher, Andrea (May 11, 2010). "'Lost's' Evangeline Lilly on 'The View': She lost the Sawyer letter when her house burned down". Zap2It. Archived from the original on June 14, 2010. Retrieved June 1, 2010. ^ "Evangeline Lilly had actually retired from acting". Digital Spy. July 6, 2018. Archived from the original on July 6, 2018. Retrieved July 6, 2018. ^ Alexander, Bryan (October 6, 2011). "Hugh Jackman's boxing is real deal in 'Real Steel'". USA Today. Retrieved September 26, 2015. ^ "Evangeline Lilly: 'Real Steel' gave me goosebumps and tears [video]". LA Times. October 5, 2011. Archived from the original on September 28, 2015. Retrieved September 26, 2015. ^ Greenberger, Robert (January 25, 2012). "Real Steel Director Shawn Levy Enters the Ring". ComicMix.com. Archived from the original on September 28, 2015. Retrieved September 26, 2015. ^ Itzkoff, Dave (June 20, 2011). "'Hobbit' Cast Adds Evangeline Lilly, Dame Edna and Sherlock Holmes". The New York Times. Archived from the original on December 3, 2014. Retrieved September 26, 2015. ^ Sieczkowski, Cavan (November 28, 2012). "Evangeline Lilly Debuts Dramatic Hair Makeover At 'Hobbit' Premiere (PHOTOS, POLL)". The Huffington Post. Archived from the original on September 28, 2015. Retrieved September 26, 2015. ^ a b "New interview with Evangeline Lilly (Tauriel)". Hobbit Movie News. September 19, 2011. Archived from the original on January 9, 2016. Retrieved September 26, 2015. ^ "Evangeline Lilly Reveals Her Fears About Her 'Hobbit' Character". Access Hollywood. October 3, 2011. Archived from the original on September 4, 2015. Retrieved September 26, 2015. ^ Kit, Borys (January 23, 2014). "Evangeline Lilly in Talks to Join 'Ant-Man'". The Hollywood Reporter. Archived from the original on March 1, 2014. Retrieved January 23, 2014. ^ Sneider, Jeff (March 24, 2014). "'House of Cards' Alum Corey Stoll in Talks to Join Marvel's 'Ant-Man' (Exclusive)". thewrap.com. Archived from the original on March 25, 2014. Retrieved March 24, 2014. ^ "Marvel Studios Phase 3 Update - News - Marvel.com". Archived from the original on January 16, 2018. Retrieved October 8, 2015. ^ Ritman, Alex (February 6, 2019). "Gary Oldman, Armie Hammer, Evangeline Lilly Team for Opioid Thriller 'Dreamland'". The Hollywood Reporter. Retrieved February 6, 2019. ^ Markovitz, Adam (June 3, 2010). "PopWatch 'Lost' star Evangeline Lilly: Children's book author?". Entertainment Weekly. Retrieved October 17, 2013. ^ "Evangeline Lilly on female empowerment and Fan Expo Canada appearance". Archived from the original on September 27, 2018. Retrieved September 26, 2018. ^ Lazar, Shira (July 19, 2013). "Evangeline Lilly Reads From Children's Book "The Squickerwonkers" At Comic-Con 2013". The Huffington Post. Archived from the original on September 11, 2013. Retrieved October 17, 2013. ^ Nessif, Bruna (July 18, 2013). "Evangeline Lilly Debuts Children's Book The Squickerwonkers at Comic-Con". E!. Archived from the original on September 7, 2014. Retrieved October 17, 2013. ^ Dondoneau, Dave; Ritz, Mary Kaye (December 20, 2006). "Fire destroys home of 'Lost' actress Lilly". Honolulu Advertiser. Archived from the original on January 2, 2007. Retrieved December 20, 2006. ^ "People Profile". People. Archived from the original on June 12, 2013. Retrieved July 15, 2013. ^ "Lost beauty Evangeline Lilly stays mum on pregnancy rumours". News.com.au. April 16, 2011. Archived from the original on December 10, 2012. Retrieved April 26, 2012. ^ "Evangeline Lilly's Lost Loves | Hollywood Heartbreaker | Dominic Monaghan". Hollywood Heartbreaker. May 22, 2010. Archived from the original on July 24, 2012. Retrieved October 17, 2012. ^ "Our First Look At Evangeline Lilly's Son Kahekili Kali!". Archived from the original on April 24, 2012. Retrieved April 22, 2012. ^ Ramisetti, Kirthana (October 23, 2015). "Evangeline Lilly welcomes second child with boyfriend Norman Kali: report". New York Daily News. Archived from the original on February 4, 2018. Retrieved February 3, 2018. ^ "Evangeline Lilly shows off incredibly toned figure in Hawaii". Mail Online. Archived from the original on December 20, 2017. Retrieved June 13, 2018. ^ McKay, Hollie (January 30, 2009). "Undies for Charity: Evangeline Lilly Launches Lingerie Line to Help Underprivileged Kids". Fox News. Archived from the original on October 1, 2015. Retrieved September 26, 2015. ^ "Evangeline Lilly Talks About Her Charity Auctions On EBay To Help Rwanda Video". OVGuide.com. January 25, 2010. Archived from the original on September 28, 2015. Retrieved September 26, 2015. ^ "Celebrity experiences and donations raise money for The Sierra Club Foundation". Sierra Club. Archived from the original on July 4, 2013. Retrieved October 14, 2013. ^ Blickley, Leigh (December 10, 2014). "Evangeline Lilly Is 'Not Interested in Trying to Pretend to Be a Man'". The Huffington Post. Archived from the original on April 1, 2017. Retrieved March 30, 2017. ^ Koerner, Allyson (December 11, 2014). "Evangeline Lilly Talks Feminism & Shines a Bad Light on What Should Be an Empowering Word". Bustle. Archived from the original on April 1, 2017. Retrieved March 30, 2017. ^ Khoo, Jamie (December 12, 2014). "Evangeline Lilly doesn't like the word 'feminism'". Elle. Archived from the original on April 1, 2017. Retrieved March 30, 2017. ^ "Call of Duty: Black Ops 4 - Credits". YouTube. Retrieved October 14, 2018.